Lockers have long been used in schools to provide secure storage for students. There are many options to consider when purchasing lockers to get the right storage for your needs. Here we run through some of the key considerations and choices available. For primary schools, lockers that are not as tall will be more useful for younger children that are unable to reach taller lockers. 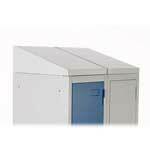 The Probe low height lockers are an ideal option where a shorter locker is required. Lockers are available in a range of door compartment sizes. Standard height lockers with 4 lockers are a common size and are big enough to hold a rucksack. Sloping tops are particularly useful in schools. These prevent the build up of litter and other items collecting on top of lockers. They simply fit on top of lockers to give the locker an angled rather than a flat top. Should you require lockers that will be situated outdoor, then weather proof lockers will be required. Unlike standard standard steel lockers, these full weather duty plastic lockers will not rust. If you are looking for lockers that are to be used in a changing room where there are showers, a more durable galvanised wet area locker would be a better choice for durability. Traditional key locking options are the most common option. Lockers generally have 2 keys provided for each locker and some lockers do have the option of buying replacement keys should they be lost, it is worth checking if these are available for your chosen lockers before ordering. A master key for lockers is also as an option for many locker ranges, this is a popular option for schools. Key-less combination locks are also available, these cut out the need to keys and the administration work this involves along with not having to worry about lost keys.